Lights in the darkness have always made people happy. There are many reasons to light the darkness, practical, ceremonial and for the pure joy of it. Lanterns have marked holidays and celebrations, honoured ancestors and loved ones and carried prayers and good wishes to parts unknown. In many cultures they celebrate the return of the light of the sun in the darkest days of the year. They can be as simple as a candle and a handful of sand in a brown paper bag or as imposing as a five-metre-high Nebuta float in Aomori, Japan. They can make any dark corner of the world a more beautiful and magical place. This website is a work in progress - a growing collection of useful information, interesting links and sweet, sweet eye candy. Enjoy. Participate in our forum, send in your photos and comments and make yourselves at home. Lantern Lab is our experimental division, and we'll post informative and possibly entertaining photos and video of our experiments. Some stuff works, and some just doesn't. That's good to know before you start. Lantern makers, this is for you! 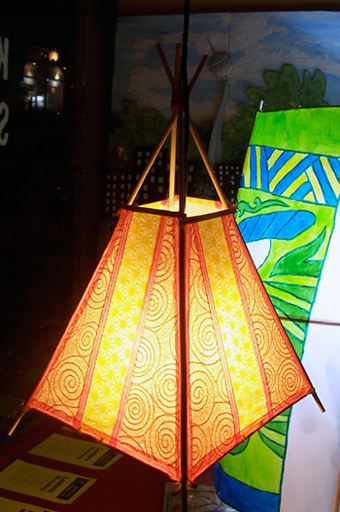 My fondest hope is that together, we can broaden the scope of lantern making as an art - from simple and fun party decorations to masterful creative works. Next time there's a lantern festival in town, let's show our communities what delights we bring to the party. 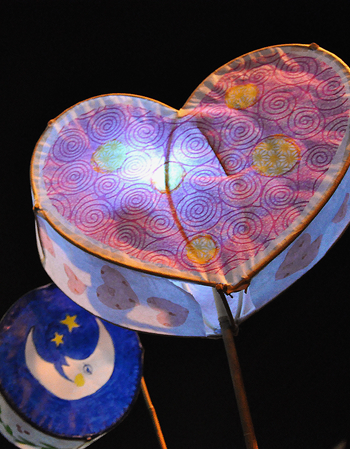 Speaking of parties, here's the results of our very first Mad Gleam Lantern Making Party. Thank you, lantern makers, for a very enjoyable day: there were glass jar lanterns, tin can lantern, and a few paper lanterns. We had a great time making them, too. Everyone wants to do this again! We also went to the Kensington Winter Solstice, enjoyed the parade and tried to convince the crowd that more lanterns were a good thing! We spotted a few cool headdress lanterns you'll see in this video. If you'd like to be kept informed about Mad Gleam events, workshops, and gatherings, sign up for our e-mail list. We may e-mail occasionally, but we will never share your address without your express permission and we will absolutely not spam you. We're too busy for stuff like that.